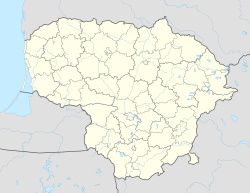 Vazgaikiemis is a village in Prienai district municipality, in Kaunas County, central Lithuania. According to the 2011 census, the town has a population of 41 people. Village is famous because of its show jumping field. Vaizgaikiemis hosts National Lithuanian Equestrian jumping championships and various international events. In 2010 Vaizgaikiemis hosted FEI World Cup Jumping 2010/2011 North Sub-League 6th stage. In 2012, the Lithuanian Show jumping Nations Cup horse show was held here. ^ "2011 census". Statistikos Departamentas (Lithuania). Retrieved August 21, 2017. ^ "Gutkauskas triumfavo Vazgaikiemyje vykusiose konkūrų pasaulio taurės varžybose" (in Lithuanian). 15 min. 2010-09-24. Retrieved 2011-03-29. This page was last edited on 20 August 2017, at 22:47 (UTC).